DURA-WELD™ Gabions and mattresses meet ASTM A974-97 requirements with regard to the materials of construction and method of manufacture. ASTM A974-97 also establishes minimum requirements for pre-assembly of the baskets and mattresses for shipping. 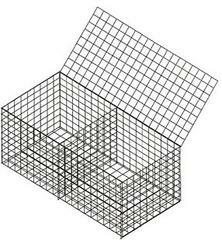 The steel wire mesh used in constructing a DURA-WELD gabion can be plain steel, stainless steel, galvanized or galvanized and PVC coated. Stainless steel and PVC coated gabions are typically used in applications where greater durability or an environmentally blended appearance is desired.